Swiss e-government specialist Procivis and electronic signature provider Skribble have announced a partnership to combine digital identity with legally binding electronic signatures. The collaboration will help close a crucial gap in the digitisation of public services and further strengthen trust in online transactions. Based on Procivis’ government-verified “eID+” electronic identity, citizens will be able to issue qualified electronic signatures on the Skribble platform and legally sign documents directly on the eID+smartphone app. The collaboration announced today includes a reciprocal integration of the two partners’ core technologies. In the first step, Skribble will allow users to log on to its platform with the help of their eID+. Users will be able to share government-attested identity attributes stored in their eID+ with Skribble, removing the need for additional in-person verification by Swisscom or another approved entity. In a second step, Skribble’s legally binding signature service will be made available in the eID+ smartphone app. This will allow users to import documents, such as rental agreements or insurance policies, into their eID+ app and sign them electronically on their mobile phone with only two clicks. While most transactions in everyday life, such as banking, shopping or using public services, can be done online, entering legal contracts still often requires for documents to be printed and physically signed. 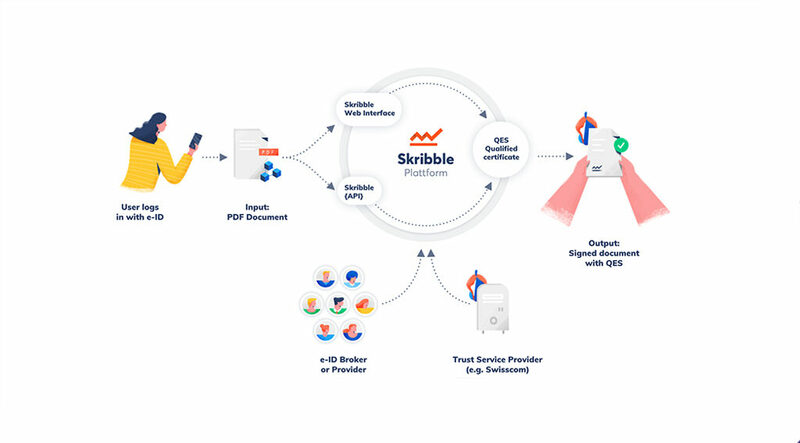 Skribble closes this gap and allows the end-to-end digitisation of high-trust processes by providing a “Qualified Electronic Signature (QES)”. A QES is the only type of electronic signature that is equivalent to a hand-written signature according to Swiss and EU law. The two partners expect the integration of their solutions to be implemented and available to customers by the middle of 2019. The post Procivis and Skribble Partner to Close Crucial Gap in High-Trust Online Processes appeared first on Fintech Schweiz Digital Finance News - FintechNewsCH.